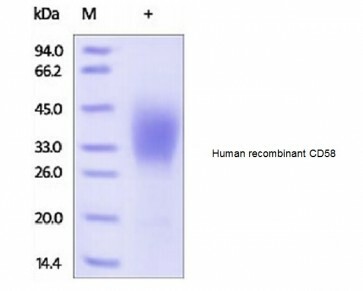 Human CellExp™ CD58 /LFA-3, human recombinant | 7427 | BioVision, Inc.
Lyophilized from 0.22 μm filtered solution in PBS, pH7.4. Normally Mannitol or Trehalose is added as protectants before lyophilization. This protein is fused with 6×His tag at the C-terminus, has a calculated MW of 22.3 kDa. The predicted N-terminus is Phe 29. DTT-reduced Protein migrates as 30-45 kDa due to different glycosylation. 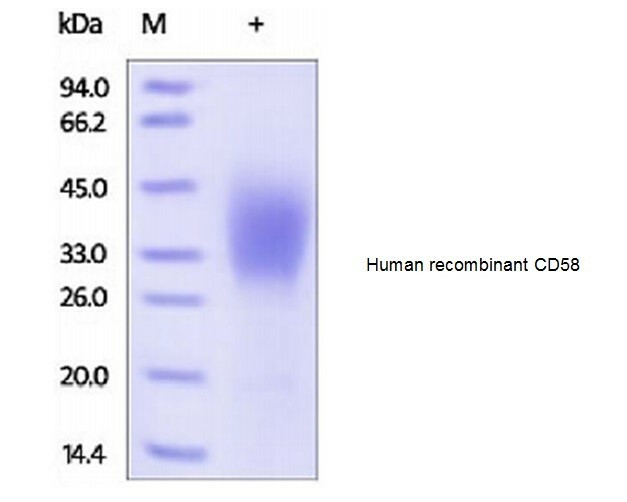 Measured in a cell proliferation assay using human CD3+ T cells in the presence of anti-CD3. The ED50 for this effect is typically 1 - 5 µg/ml in the presence of anti-CD3 immobilized at 25 ng/ml. Centrifuge the vial prior to opening. Reconstitute in sterile PBS, pH 7.4 to a concentration of 50 µg/ml. Do not vortex. This solution can be stored at 2-8°C for up to 1 month. For extended storage, it is recommended to store at -20°C. 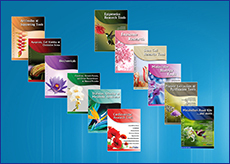 CD antigen CD58 is also known as Lymphocyte function-associated antigen 3 (LFA-3). CD58 is a cell adhesion molecule expressed on Antigen Presenting Cells (APC), particularly macrophages. CD58 /LFA3 is ligand of the T-lymphocyte CD2 glycoprotein, which binds to CD2 (LFA-2) on T cells and is important in strengthening the adhesion between the T cells and Professional Antigen Presenting Cells. In addition, the LFA-3/CD2 interaction may prime response by both the CD2+ and LFA-3+ cells. Polymorphisms in the CD58 gene are associated with increased risk for multiple sclerosis.